New York Times best-selling author Michael P. Spradlin is back with epic new adventure novel. 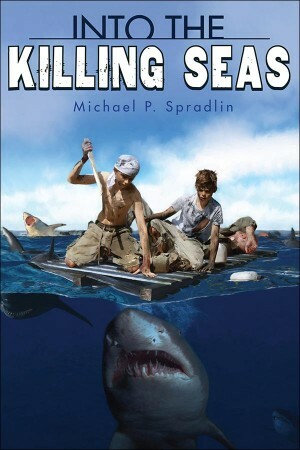 Into the Killing Seas is based on the true events of the 1945 sinking of the USS Indianapolis, tells a harrowing story of World War II. In 1945, in the waning days of World War II, two boys stow away aboard the U.S.S. Indianapolis as it sails from Guam to the Philippines. Separated from their parents at the start of the war, the boys hope to reunite with their family. But their hopes are dashed when a Japanese submarine sinks the ship in the middle of ocean. Patrick and Teddy, with the help of their friend—an injured Marine named Benny—are not too worried at first. They expect to be rescued soon. They can handle the thirst and the dehydration. Even the occasional madness that seems to possess some of the ship’s surviving crew. But as they float along in the water, they discover that the real danger lies beneath. And it has teeth. [dropcap]I[dropcap]’m not sure how long I lay asleep half in and half out of the water. It could have been hours or minutes. When I came to, I was still clinging to the pallet and Teddy was whimpering softly, something he often did in his fitful sleep. The night sky was as dark as it had been when we abandoned ship, but it was growing lighter far off on the horizon. The moon cracked its way through the clouds and I could see Benny floating along, his burned hands twisted in between the wooden slats of our makeshift life raft. He groaned and muttered soft curses under his breath. The sea had calmed some and the waves were not quite as high as they’d been before. Still, even the smaller ones tossed us about. I wished I could find a way to get some height and have a look around, but I was still so exhausted, my head and shoulders remained planted on the wood. As I wiped the sleep from my eyes, I realized that we weren’t as alone at sea as I’d thought. Around me, I voices all yelling at once. From the sound of it, a whole bunch of the crew had managed to abandon ship. But from their cries for help it was also clear a great many of them were injured. “Where’s the doc! I got a wounded man here!” I heard a husky voice call. Every ship had at least one doctor plus several medical corpsman. If I could find one of them, maybe they could help Benny. As if he knew I was thinking about him, he moaned, lifted his head, and looked around. “I’m right here Benny,” I said. “Nah, not yet. The sun will be up soon and I hear a lot of guys yelling for help, but I don’t see them. Or any help for us,” I said. “Yeah. With these waves, I’ll bet our guys are scattered everywhere. Hard to keep track in the dark—” Benny stopped talking and gave out a groan. It sounded like he was in agony. “What’s wrong Benny?” I asked. I didn’t know what to say. If we were in the jungle, I could have found lots of things to help Benny. Fresh water, plants that would help his burns heal, even mud packed on the wounds would stop infection and ease the pain. The Chamorro taught me a lot about survival and living off the land. In the jungle. Not the middle of the ocean. But maybe one of Benny’s shipmates could help him. Their voices sounded like they were coming from all directions. “Where’s the doctor?” the husky voice shouted again. I heard another voice answer but it was too far away to understand. “Help! Over here!” I shouted. “Who’s goes there?” A voice came back. “We’re hurt, there’s an injured Marine here!” I said. There was no response for a moment. Benny groaned and though it was dark and nearly impossible to see, I had the sense he had passed out again. At any rate, he was silent. I thought about what he said. That he didn’t like Sergeant Stenkevitz back on the ship. And he seemed like a jerk. Now he was telling me to stay away from this guy named Colosi. Maybe I should listen to him. What if they tried to take the pallet away from us? What would we do then? More men shouted out to each other from somewhere. The noise and size of the waves made it difficult to determine where their voices were coming from. It still wasn’t light enough yet to see much. But I had an idea. “What!” he said, I could tell I startled him awake. “That’s a real good idea, pipsqueak. You’re thinkin’ like a Marine. Makin’ an assessment of your tactical situation. Choosin’ your course of action. But here’s the thing. Your troops is done in, Patty boy. Teddy is too wrung out to help. And as much as it pains Benjamin Franklin Poindexter, Private First Class, United States Marine Corps, to say it, I ain’t fit for duty right now. Besides I’ll bet that doc’s waitin’ room is full up right now. Lotta wounded he’s gotta tend too. Assumin’ it was even him them swabby’s heard. We should just wait here. Someone will be along to rescue us soon,” he said. Something was different in Benny. Never once could I remember him saying not to do a thing, or that we weren’t going to find a way to accomplish what we set out to do. Benny, he was always upbeat and positive. Except for swabbies and that Sergeant Stenkevitz we’d run into when he was hiding us on the ship. he never had anything bad to say about anything except maybe Hank Greenberg and swabby’s. Now he was making up a reason, an excuse not to try something. I figured it was my turn to get him going. “You always told me Marines never give up,” I said. “I guess,” I said. But I wasn’t convinced Benny was right. I was thinking about the chaos on board the ship when the torpedoes hit. How fast the Indianapolis went down. I remembered some of the crew saying nobody knew for sure if the distress call went out. How the communication system got all blown up with the first hit. Nobody even knew when to abandon ship because the speakers didn’t work. I wasn’t sure Benny was thinking clearly. Maybe nobody was coming for us. At least not for a while. I rested for a few minutes. The pallet was doing an admirable job of keeping me afloat. I had no idea which direction was which, but there was light starting to break off the horizon to my left, so I knew that must be east. I heard some guys shouting again, not Colosi or Wahlquist, some voices I didn’t recognize coming from behind me, and it reminded me again about the doctor. If Benny and Teddy couldn’t help, it didn’t matter. I could. I worked around to Teddy’s side of the pallet and started kicking with my legs, pushing it slowly toward the sound of the voices. I wasn’t making much progress. But it was something. I was getting closer. The voices were getting louder, clearer. And suddenly I could make out what the men were shouting. Dozens of them. They weren’t calling for the doctor anymore. They were screaming for their lives. “No! Dear God! No!” I heard a single voice cry out. “Help! Someone please help me!” More voices joined in. There was a high-pitched, almost squeaky voice from somebody who sounded young and terrified. A gruff, hoarse cry—probably somebody from New York because he sounded like Benny—oniy with a deeper tone. Then a southern accent shouted out in horror, joining an overwhelming chorus of screams. They sounded as if they were being tortured. Then the youngest sounding voice spelled out the reason for their alarm and I instantly grew terrified myself. “Sharks!” he yelled. “Everywhere! Look out—” His words died in his throat and he made the most horrifying, anguished sound I’d ever heard. On Guam, when someone was shot, death usually came quickly. A bullet ripped into someone’s chest, and that was it for them. Or sometimes in the jungle we had to leave our wounded behind because when you’re being hunted by the Japs, silence is life and noise is death. And the wounded tend to make noise. I tried not to think about the ones we’d abandoned. The Japs always caught up with them quickly. Usually you’d hear a single gunshot. And then their cries would stop. Now it was sharks. There were sharks in the water. And from the sound of it, they were all around those men. I stopped paddling and floated there, waiting for someone, anyone to tell me what to do. Benny was too far gone at the moment to realize what was happening. And then, below the surface of the water, something hard and scaly brushed against my leg. The sharks had found us. This entry was posted in Fiction and tagged free, homepage on May 12, 2015 by Clay Swartz.